This very short piece of news in Bloomberg this morning is straight to the point, how the hell are you going to export to countries (whenyou now need to live from exports) if those countries are having massive devaluations while you mark time. Oh, I know, the Ukraine and Russia represent only a small fraction of Baltica exports, but they aren’t the only ones falling, the Romanian Leu, the Polish Zloty, the Hungarian Forint, the Czech Koruna are all falling, and all these countries are direct rivals for market share in the rest of the EU. AB Snaige, the only refrigerator maker in the Baltic states, will cut about 300 jobs in its Lithuanian factory, citing lower demand in Russia and Ukraine as both the ruble and hryvnia lose value against Lithuanian litas. Sales in Russia and Ukraine have â€œstoppedâ€ and â€œthere is no evidence these markets will reviveâ€ during the first quarter, the Alytus, Lithuania-based company said in a statement to the Vilnius Stock Exchange today. The company employs â€œmore thanâ€ 2,300 workers in its two factories in Lithuania and Kaliningrad, Russia, according to its Web page. Basically as I say, it also matters which currency you are pegged to. One commenter has made this point. Regarding Latvia, I’m working for industrial company in Latvia, with most customers from Sweden or Russia and latest SEK and ruble rate changes have really eaten up business both for export and import. From SEK/LVL we lose in funny sequence, more you sell – more you lose. Today, here are a lot and a lot of industries closed, closing or planning to close. Evidently there is a lot of “restructuring” going on, but is it the kind of restructuring Latvia and Lthuania need, I ask you? Here’s the chart of the Euro with the Swedish Krona. 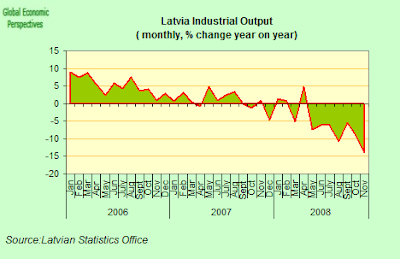 Finally, here’s Latvian industrial output for November, anyone spot the trend? And incidentally, Latvian exports were down 19.7% between October and November 2008. Oh, I know, I know, not only doesn’t Latvia need exports, it doesn’t need industry either. Meanwhile, onwards and downwards we go. This entry was posted in A Fistful Of Euros, Economics and demography by Edward Hugh. Bookmark the permalink. > Oh, I know, I know, not only doesnâ€™t Latvia need exports, it doesnâ€™t need industry either. Well, then whom would the members of the eurozone export to besides each other? Well, obviously in the Latvian case countries like Ukraine, Russia, the UK, Sweden, Denmark – assuming that one day Latvia is a member that is. The issue is at what exchange rate the country enters the zone. I donâ€™t know what E-P is going on about in terms of â€œleaked documentsâ€ – no one in Latvia seems to have heard of them, although they do sound good journalistically, they feed conspiracy theories. If you take the trouble – as I did – to read the IMF report it is plain that the IMF seriously considered a 15% trading band (which would have meant a 15% devaluation) but that it was the EU Commission who said no. This is there in black and white, and there is nothing secret about it. I will return to this when I reply to Christoph Rosenberg. As to exports outside the Eurozone, this is not a simple one for one game. Finaland and Germany, for example can export to China, and maybe India and Brazil in the future, and then the Baltics (eg) can export to Finland and Germany. It depends. What we now need – it is obvious really – is a much bigger external surplus (since internal demand is going to be weak for at least the next 5 years as we pay down the debts we rae now accumulating) – so that will put the eurozone among the strong external surplus regios that Brad Setser and Martin Wolf so strongly dissaprove of. We will just have to withstand their wrath Iâ€™m afraid, and look for CA deficit countries (like maybe India and Brazil etc) to help balance the global books. As Martin Wolf himself admits, all this is not a morality play, it is plain, technical macro economics.